After I took the picture, I had to check. Indeed, on my can of expanding foam it says "360 degree application" and "quickly fills large, awkward holes and cavities". But it definitely doesn’t say anywhere, even in small print, "in zero gravity conditions". This is not my mess, I hasten to add. 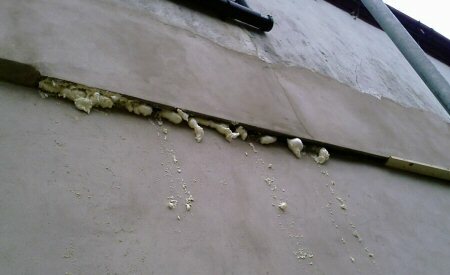 Admittedly, I could have been capable of overestimating the mighty power of expanding foam and trying to fill a high-up crack from the bottom, but I’d like to think that if I started off expecting to beat the laws of physics, I’d at least be smart enough to give up once I’d spotted the signs that I just wasn’t that powerful. 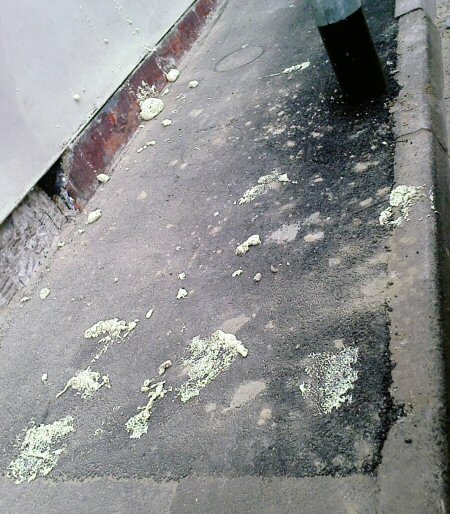 Clearly it’s someone else’s job to clean up stray filler once it’s fallen onto - or in the vicinity of - a public street. Plus, the longer you leave it, the easier that’ll be. I have to wonder whether the master craftsman actually used a ladder or was reaching up high to fill the gap from underneath. So I’m going to keep my eyes open for a mysterious figure walking around town that looks a bit like this.